This article examines what you can do as a plugin developer to maintain backwards-compatibility template support, while utilizing the newer template-loading approach as featured in BuddyPress 1.7. We will walk through a real-life case study involving the BP Follow plugin and what was done to update the plugin for BuddyPress 1.7. For the rest of you, this approach was fine for versions of BuddyPress previous to 1.7 as BP was only specific to the bp-default theme. However, if we don’t alter the bp_example_load_template_filter() function, what it actually does is bypass the universal theme compatibility code, which is the main feature in BuddyPress 1.7. Obviously, we do not want to do that! 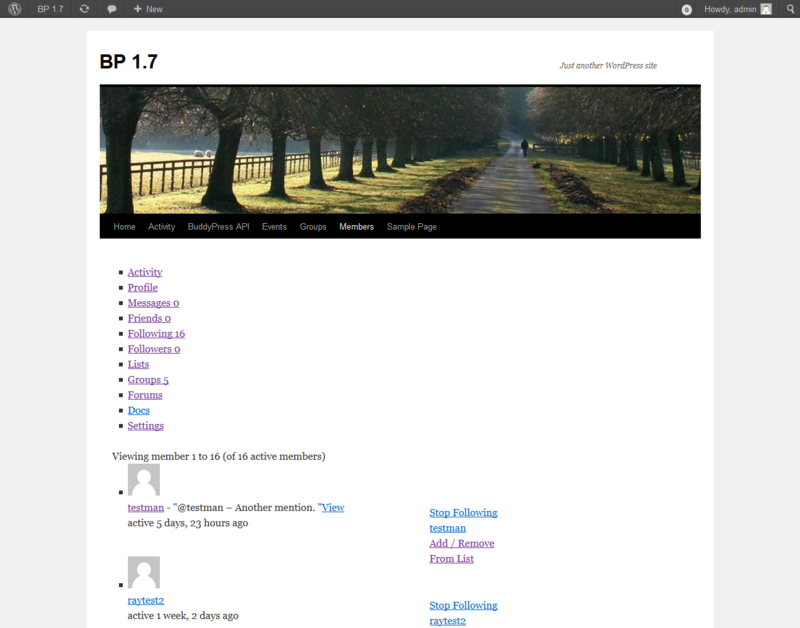 What we’re going to do is make the BP Follow plugin look like the second screenshot so it will be ready for BuddyPress 1.7. BuddyPress 1.7 comes with some awesome new template-loading functions like bp_get_template_part(). However, not everyone will be upgrading to BuddyPress 1.7 immediately, so we need to include some 1.7-compatible code with our plugin to ensure that this new code will work on older BP installs. We will utilize some of these functions a little bit later, but let’s get back to that first screenshot from the Intro section. So what is happening in the first screenshot? If we analyze the bp_follow_load_template_filter() function, we can see that it is similar to the BP Skeleton Component as referenced in the Intro. Which is a full page template (using get_header() and get_footer()) and not a template part. Since our function always returns a template location, we will bypass the universal theme compatibility code that runs on lines 397-411 and our full page template will be loaded. // Only filter the template location when we're on the follow component pages. // which will act more like a template part. What we’re doing here is checking if $found_template is empty. exist in the parent or child themes because locate_template() is used. This is great for themes that might have overriden the old templates that came with BP Follow and handles our backwards-compatibility requirement. If $found_template is empty, we can start to add some code to add our new template parts! The BP Template Stack is a new approach in BP 1.7 to locate templates residing in different directories. bp_register_template_stack() is a function that allows us to register a template directory where BP will attempt to find templates in. The first parameter is a function callback returning a directory that houses templates; the second parameter tells BuddyPress when to look at this directory. If we look at the above example, what this means is BuddyPress will look in the stylesheet directory (or child theme’s directory) for templates first since it has a priority of 10. Next, BuddyPress will look for templates in the template directory (or parent theme’s directory) if it could not find it in the child theme since it has a priority of 12. // we're not done yet! read on to the next step! We’re giving it a priority of 14 so it is checked after the stylesheet and template directories. Now, we have to make sure that we still support the bp-default theme, since a lot of people will still be using that theme. // we're almost there! let's move on to the next step! We are redeclaring the passed $found_template variable to look for 'members/single/plugins.php'. locate_template() will attempt to find this template in the child and parent theme and will return the location of this template if found. Since we’re thinking of bp-default users, this template will always be found since that template is bundled with bp-default. Therefore, this template will be loaded by BuddyPress. If we’re using any other WordPress theme, BuddyPress’ theme compatibility will kick in later since this template will not be found. Lastly, we need to setup our new template parts so they will be loaded by BuddyPress. add_action( 'bp_template_content', create_function( '', "
We are adding a hook to the "bp_template_content" action to load our new template part with the bp_get_template_part() function that we added from our 1.7 compatibility code in step (1). If you’re wondering what create_function() is for, it’s just a way to create an anonymous function without having to create a real function. You can still create a real function if you wanted to. And the same result would occur. Anyway, back to our regular, scheduled programming! For the new template parts, we cannot use the same location and filename due to backwards-compatibility issues. Hence, for BP Follow, we simply went with /members/single/follow since the “Following” and “Followers” screens use the same information. Notice that /members/single/follow is a template part and that the templates reside in a subfolder called ‘buddypress’. The 'buddypress' subfolder is just another one of those cool BP 1.7 features to help separate custom templates in your theme directory just a little bit better. Make a few changes and they would override the bundled template part from BP Follow. To find out a little more about this feature, read this codex article. If your own BuddyPress plugin uses more than one template, you will have to introduce a bit more logic. The bp_follow_load_template_filter() function is now complete! And our second screenshot from step (1) should now show up. So to summarize, what did we just do? Re-route older template locations to use our new template parts to avoid conflicts. The beauty of this entire approach is older versions of BuddyPress (tested down to v1.5) will inherit some of 1.7’s template-loading features as well, so we get to be both backwards-and-future-compatible with the way we utilize templates in our BuddyPress plugin.